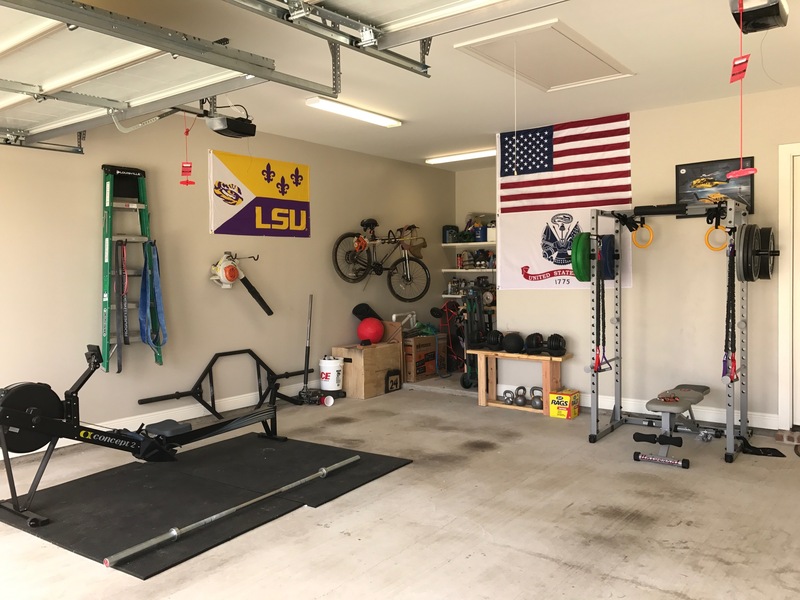 Garage Gym of the Week: Ryan S.
Tell us a little bit about yourself: Happily married, and father of one to a son and a four legged daughter. Former Army helicopter pilot, but now working a desk job at a helicopter transportation company. How would you describe your training style (CrossFit, Olympic Weightlifting, etc.)? Mixture of Crossfit and conditioning training. I'm trying to find a happy spot between college weight and dad-bod. How would you describe your fitness/strength level, currently? I would say that I'm very close to where I want to be, which is living a well rounded healthy lifestyle. Of course I want to slim down my body fat, but I'm at a point where everything is in sync or balanced. A balanced diet and exercise routine was almost impossible for me. I would dedicate all of my energy to one or the other in years past. What are your fitness/strength goals? I hit a goal of mine yesterday, rowed 10,000 meters without stopping. Future goals are to do the Murph Challenge without scaling. My strength has always been mindset. I have always had a way to accomplish what I really set out to do, so now I just need to put the work in. Describe your garage gym. My garage gym has a lot of elements from a crossfit box. It's pretty basic, but it gets the job done. Who works out in your garage gym? Mostly myself, but my wife is starting to get into it. I have an 8 year old so he enjoys the pull up bar and a few light weights. 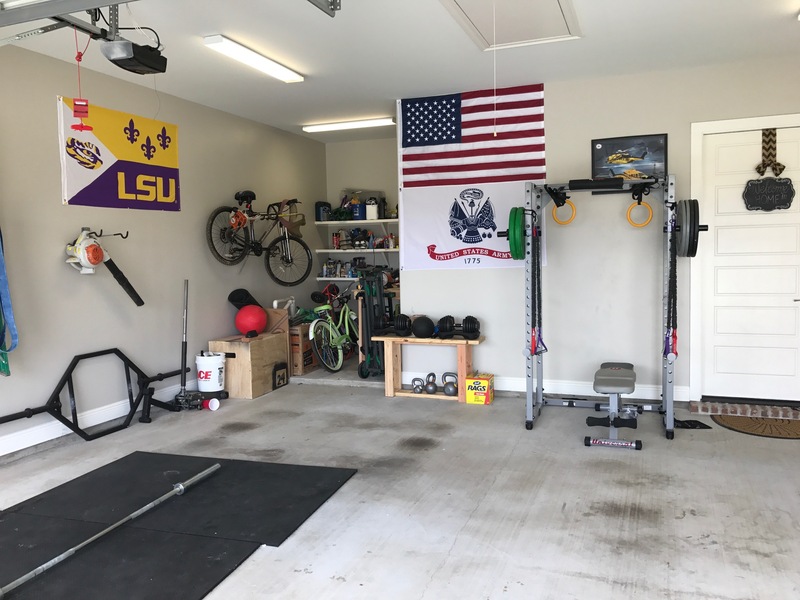 Why did you build a garage gym? It was an easy decision to solve two problems. I needed to make a lifestyle change for my health, and I only have so many hours in a day. I can get a daily workout in without having to dedicate the time to drive to the gym, prepare, etc. I can come home from work, be a good dad, and still get a workout in before the day is over. I've had gym memberships before and its way too easy to find excuses to not go. What’s your favorite piece of equipment in your garage? Squat rack. It's not the best in the world, but it provides me the peace of mind to do squats alone safely. So many other functions as well, but its my go to favorite. What piece of equipment was a waste? None so far. I usually don't buy something based on impulse. I have to know I will use it often or that it will serve a purpose before I throw money at it. I would say my least used is my rings, but my pull up bar is being delivered today so that will change very soon. What’s the next piece of equipment you’re going to get? I'd really like some farmers walk handles soon or another bar. Any dream piece of equipment? Not really, maybe a GHD eventually. How did you build your garage gym? (All at once, craigslist over a few years, etc.) Over the last year, I've bought pieces here and there. I usually buy new, but I'm not opposed to used if it is a good deal. The rower was definitely the biggest investment but is probably my favorite for cardio. I love it. Do you have any tips for anyone else looking to build a garage gym? I would say make sure you spend time evaluating what your goals are when buying equipment before you buy it. I've come close to buying a high end power rack with all of the bells and whistles but I settled for something functional to what I would really be doing. One day I may upgrade, but for now this is suitable to me. I am also a firm believer in buying the best when it is something you will use often. I knew rowing was important to me, and I wanted to get what I personally thought was the one of the best pieces out there. FringeSport has been a great resource for building my gym, not trying to plug but its a great source of quality gear. Awesome customer service as well.